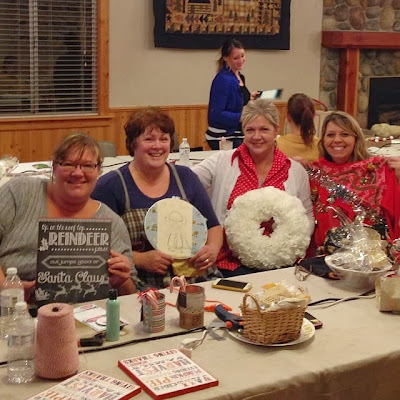 Shannon and I enjoyed a wonderful weekend of crafting and meeting wonderful women! We joined Marci Welcker of Fallow Field Farms for an Artsy Retreat! The weather was rainy & cold, the perfect setting for crafting all day long! Shannon decorated the mantel in this lodge style location using her beautiful vintage Christmas post cards. The warmth of the fire kept us cozy into the late night hours! Delicious food was served, amazing desserts were shared and prizes and gifts were given out all through the day! I met the most amazing and talented women and watched the fun projects they crafted and wished I could have done every single project! Some of the attendees are listed below...take note! join us in following them on Instagram, Blogs and on Facebook! Cake For 2 decorated the adorable corner display and gave us all kinds of ideas for inexpensive holiday decor! then spray painted and glittered for the season! Dru Beecher of Polka Dot Poplars did the most fun "12 Days of Christmas" craft! She has all kinds of goodies to add to your calendar to make it special! $26 for the kit! Some of us just hung out and caught up and finished projects that have been on the back burner for so long! Look at the amazing wreath Becky put together! Gorgeous! Kelli Hansen (on the left) made the most creative & original pillows for the gift exchange! Pickin N Peddlin was there making her "ugly" Christmas sweaters which were so cute! Watch for them on KSL! She sells them for all of the "Ugly Sweater" parties that take place in December! I think I made three trips with ladies back and forth to this fun holiday market! The vendors were amazing and the spirit of the season was in full swing...! As I reflect back there was not one thing I would choose as my "favorite" part of the day...every minute of it was amazing! Make sure and follow Fallow Field Farms Blog for future events!